My Mom who is 56 wanted to see this movie. She was content and pleased when she left. It was OK for me - typical B type ninja movie. Lots of gore and fighting...5*'s for that. I would be just as happy to see this one as a rental rather then the cost on the big screen. possibily one of the worst movies ever made..the ending was predictable, logic was obviously not utilized when writing the script. Wow Jeong Ji - Hoon a.k.a Rain was really good in this movie. Even though the plot was just like every other action movie i still have to admit that the action was just awesome. I guess Jeong Ji - Hoon has already made his debut with this role aside from his speed racer role. Plot for me 3 out of five the action as i said before a 5 out of 5 rating. Good action movie but too much blood though. 300 and NINJA ASSASSIN BEST ACTION MOVIES SO FAR IN OUR LIFE TIME!@!@! This movie was totally awesome. I would go see it again. The fight scenes were totally amazing full of action. Can't wait for it to come out on dvd. Other than the good cenematics Horrible movie plot holes you could drive a semi through. Like the scene where a convoy of army trucks sneaks up a mountain and bursts through the gates to surprise a ninja clan - please. Ninja. Assassin. The only thing that could make this movie cooler is if he was also a millionaire cowboy astronaut. This movie rocked. I really loved this movie. Rain was amazing in it! Ready... set... decimate the enemy. This was a pure adrenaline movie. Classic "B" martial arts story with amazing fight scenes. Quentin Tarantino never spilt this much blood. great movie...the best movie i have watch in the year 2009...!!! I usually don't find long hair attractive on men but this guy wears it well... Lots of blood but I liked this movie. Well done, ninja! At last a good movie comes along. Awesome, everything was in place. Great acting, action all over & story line was classic. THIS MOVIE WAS FREAKIN EPIC! Action sequences were insane and story was great! What a fantastic action flick, definitely 5 stars. Blood was better than 300! action packed! if you don't mind a little gore, one of the best action movies ever! great movie..go and watch it..
loved the movie...i watched it three times already but i still want to watch it.very very good..actors were great..really awesome.. awesome!! just loved it sooo much! action are great, acting was great!! my boifriend loved it, and im sure i loved it too! I loved this movie. Move over New Moon this is the movie people should see. Not all action movies are for guys becasue I'm a woman and I absolutely thought this movie was amazing. Men and Women will be entertained by the non-stop action. If people want a little romance it's there as well but I just waanted to see the fighting and there was plenty of it! Rain was completely awesome and I'm now a complete fan of his. It was great to see another movie with two ethnic people as the leads. 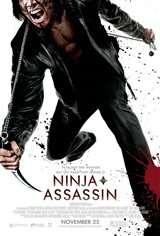 People should definately see Ninja Assassin! Awesome movie much better than 300. Good action, excellent special effects and a good story line. loved this movie, can't wait for it to come on dvd!!!!! Sho Kosuji the actor who played lord Ozunu was the best actor in the movie. But given that he is very well known for his ninja acting in Japan it's not suprising. Besides him the acting was mediocre to really bad it made me fall asleep. But this is an action movie who needs acting and story. Really cool action scenes and lots of blood. Somewhat Tarentino style as in it's gore, blood and anime likeness but none of the humour or really interesting characters. Worth seeing it in the big screen for the Action scenes, just sleep through the rest. Totally worth 4 stars when you take the movie for what its supposed to be, a non stop action movie. The cgi was tasteful and actually looked pretty good. Of course you cant have a story without some romantic entanglement so that was expected. The action sequences were amazing, the gore was really good. and the movie overall was very entertaining. No oscar performances here but thats to be expected. very entertaining. Don't expect a titanic-story-telling story while u walk into this film. This is about 'ninja'! just watch this expecting some great combat sequence (remember, ninjas are expert in ambush, so most of the fights WILL take place in dark scene), and non stop action. Light, fun, lots of blood, entertaining movie. Not a bad movie. Worth watching on a big screen. Kind of Tarantino style. A lot of blood. Overall not a bad movie. I would recomend watching. Blood and Gore, a lot of great action! !I would watch it again.Rain was great with his Hollywood debut!! Gave onely 1 star because th elead actor has G8t Abs..other then that take a pass it's HoRRid..no plot, a bit of same old action and effects...The black lead actress can't Act..Neither does her commander, who swiches through 3 fake accents german/russian and french wt_f. is all i have to say.